In Clue, the pawns are more than pawns – they’re characters. Of course, you won’t be playing them that way – you won’t even know if you’re the killer until the envelope gets opened – so it makes no difference which one you choose. 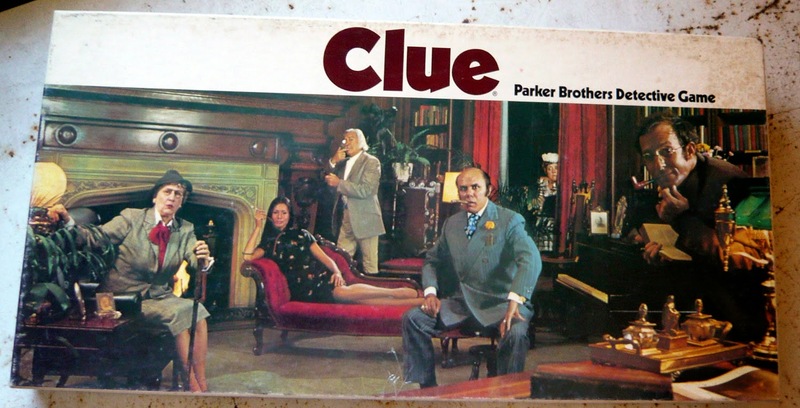 Nevertheless, I used to pore over the Clue box as a child. We had the 1972 edition, with the very expressive live models. I went way overboard studying those characters’ faces and thinking about who they were. How was each of them likely to react when they found a dead body in the house? What perspectives would each of them bring to the investigation? And what motives or secrets might each of them have? The idea of playing as a character, even in that very limited sense, switched something on in my brain that has never been switched off. The next time someone asks you that stumper question – just what is a roleplaying game? – I recommend explaining it to them in terms of Clue. Imagine we’re playing Clue (you’ll say), but instead of using your pawn as a counter, you’ll also speak and act as the corresponding character. When you talk to other players, you’ll adopt his personality. It’s up to you how you play your character. Some things you do and say will directly impact the murder mystery. And some things you do will have no real game-impact – you’ll just do them for the fun of playing a character. The point here is that the pawn you choose changes the way you play the game. If you’re Plum, that means brains and bookish skills – if you’re the Colonel, it means using your no-doubt extensive knowledge of strategy to catch the killer. Now, wait – how will you be able to play like you have those skills? Well, each time the Professor tries to do something bookish, he’s more likely to succeed at it than any other character. Similarly with military strategy for Mustard, or any other skill you want your character to have. You usually get to decide. Different rpgs have different ways of representing skills in the game, but it usually involves a special dice roll. In a boardgame, your main goal is to achieve some in-game objective – getting to the end space or, in Clue’s case, to find out which cards are where. In an rpg, your main goal is to discover and experience a storyline, regardless of whether you’re “winning” or “losing” in-game. So who tells you what you see when you get to the Conservatory or look at the blood spot? Well, one player isn’t playing a character at all. He’s the game master. He has the environment of the game tucked away in his brain. Chances are he created it himself. Because there’s a game master and because we’re all using our imaginations, you can do anything your character would do (and, remember, there are rules and limits on your skills). Oh, and, if you’re the killer, you’d certainly know it.